We all came to know Olympic gold medalist Laurie Hernandez and her infectious smile at this year’s Summer Games in Rio de Janeiro. She was a member of the “Final Five” for the U.S. women’s gymnastics team. After her Olympic success — and before she hugged Beyoncé at the MTV Video Music Awards — I met her in person in her hometown in New Jersey and found out that her sunny smile had been hiding hurt from some criticism that went largely unnoticed throughout her media tour. We all heard about her teammate Gabby Douglas receiving countless criticism as an African-American female gymnast in Rio, whether for not putting her hand over her heart during the national anthem or appearing not to support her teammates enough during their routines. The hashtag #CrabbyGabby even trended on Twitter. Besides being called “un-American,” Douglas was subject to ridicule aimed at her physical appearance, such as her hair. Hernandez and Douglas wore the same uniform. They shared the same coach. Their experiences diverged, however, in large part because of which cultural minority they hail from. I asked Hernandez if she experienced any backlash as the first U.S.-born Hispanic athlete on the team since 1984. I wish I had perfect grammar. Yet here Hernandez was getting flak for that very thing. “You get criticized for not speaking Spanish?” I asked. Fake Puerto Rican. “But you’re Puerto Rican,” I said. There is an outdated and patronizing notion that there is a “one-size-fits-all” strategy to identifying Hispanics in our country. Sorry to break it to you, but we don’t all speak Spanish and we don’t all eat rice and beans. The unfortunate reality for Hispanics in the United States is that our identity is constantly being measured by standards that have nothing to do with cultural reality. The scrutiny cuts both ways when it comes to language. 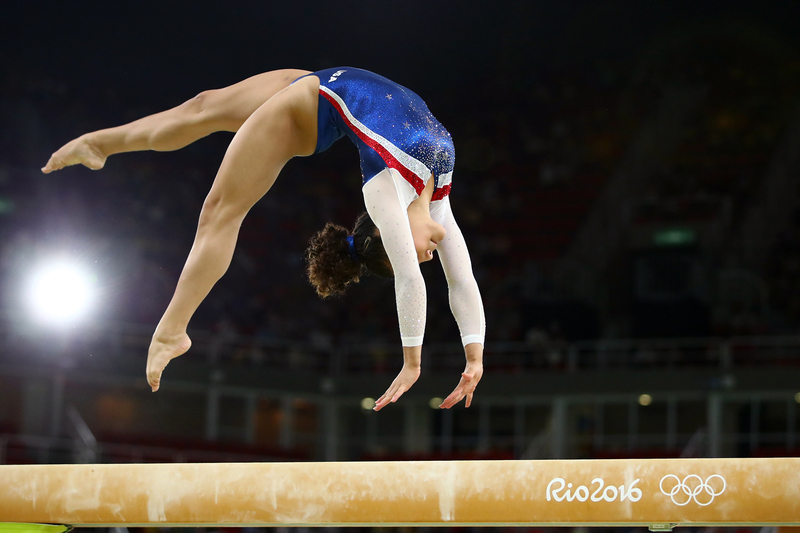 Laurie Hernandez of the United States performs during the Gymnastics Rio Gala on Day 12 of the 2016 Rio Olympic Games on August 17, 2016 in Rio de Janeiro, Brazil. Carlos Gomez, a Dominican baseball player for the Texas Rangers, has the exact opposite experience. He was quoted in a Houston Chronicle column earlier in the season when playing for the Houston Astros and his English was picked apart. English is a second language for Gomez. He felt he was misrepresented in this quote and called out the writer on Twitter back in May. As Hispanics in the United States, we are given a score on a performance that we were never trained for. So you’ve got two athletes: Gomez — not speaking English makes him less American; and Hernandez — speaking English makes her less Hispanic. You can’t win. Either you’ve integrated yourself too much or not enough. I called my mom to talk this out. She teaches English in the Bronx, New York. Growing up for her was confusing. I called ESPN reporter Pedro Gomez. He navigates Major League Baseball clubhouses, where 30 percent of the players are Hispanic, and his Cuban background benefits him. He takes the information he gathers and relays it on ESPN to, as of 2013, a 91 percent non-Hispanic audience. The dividing factor here is language. As a kid, my dad was made fun of for not speaking English when he came to New York from Puerto Rico with my grandparents. So for my father, his intention in raising me and my sister was to make sure that wouldn’t happen to us. He spoke English in the household. But just because my father taught me how to catch a baseball with English instructions, does that make me any less of a Hispanic? Think of Boston Red Sox slugger David Ortiz. He’s one of the most well-known Dominican baseball players in the MLB. His children were born here in the United States and his wife is from Minnesota. So his kids are half-Dominican, half-American, and were raised in the United States. They are going to carry the name Ortiz. Sure, they aren’t raised the same way as their father was, but no one is going to say that Ortiz’s kids are not Hispanic. What happened to embracing the individual? What happened to the melting pot? Examine the landscape at large. These presumptive labels get attached far too often to all of us based on race, gender, sexual orientation and, yes, ethnicity. Democratic presidential nominee Hilary Clinton: Is she man enough for the job? San Francisco 49ers quarterback Colin Kaepernick: Is he black enough? Can a white guy listen to hip-hop? Can a gay guy be masculine? Can a Hispanic woman get away with not speaking Spanish? There’s nothing fake about Hernandez. She’s as real as that gold medal around her neck.